The University of Mississippi and the Office of Pre-College Programs are proud to once again host the MSEF Region VII Science and Engineering Fair. 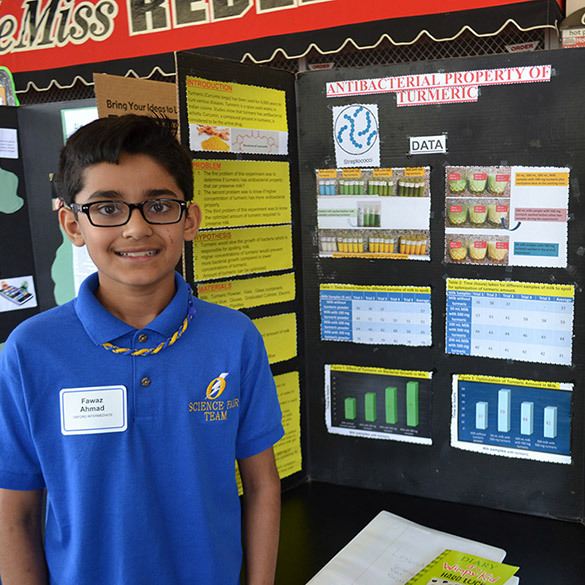 Local school science fair winners in our 16-county region will compete for 1st place – 5th place trophies and ribbons awarded to students plus an additional 25-40 special awards. Students and their teachers are to be commended for their hard work and dedication for the outstanding projects we expect to have at this year's fair. As schools and students arrive, the key teacher or designated representative will want to officially check the school into the fair. The school check-in table will be located at the front entrance of the Coliseum. Only the key teacher or designated representative will be allowed at the table. The check-in table will close at 9:30 a.m. or when all schools have checked-in, whichever is earlier. The HUB is fair headquarters and located on the arena floor next to the projects. The HUB is where students will come if they need help or have questions, where judges will turn in scores, and a central location for fair management. NEW to MSEF REGION 7 FAIRS! Students will report to their designated project area and set up their projects on the arena floor or around the concourse. As of 2016, students will receive their own Science Fair Pak, complete with instruction letter, campus map, name badge, judge card, certificate of participation, and cool swag from our sponsors. Upon arrival to the Coliseum, students will be able to find their project number and designated project area on the arena floor or concourse and begin set up of their project. Students do NOT have to meet with their teacher to get important information or documents. The Key Teacher or designated representative will want to go by each project area to verify students are here. Student projects must NOT exceed 36 inches wide by 36 inches deep by 108 inches tall (floor to ceiling). Chairs will NOT be provided unless there is a special need. All projects must pass a Fair Violation Check before the project will be judged. This check will verify the projects dimension and display/safety violations as determined by regional, state, and international rules and guidelines. Be advised that NO food or liquids, including refreshments, will be allowed in the project location areas (arena floor and concourse). Food and drink items may be consumed in the seating area of the Coliseum only. Please review the ISEF website for current and up to date information on Display and Safety Regulations. Note: Dimensions listed on the ISEF site are for the international Fair, NOT MSEF Region 7 Fairs. Projects requiring electricity may use AC dry cell power sources only. Electricity will NOT be guaranteed at the fair. LIGHTING IS NOT CONSIDERED AN ESSENTIAL PART OF ANY PROJECT. Since MSEF Region 7 Fairs now require a Violation Check of projects, time constraints on checks and judging have become a reality for our fairs. As of 2016 fair season, MSEF Region 7 Fair policy maintains that ALL student projects are required to be set up by 9:30 a.m. and no later. Projects set up after 9:30 a.m. will risk being disqualified or getting a lower score in judging if the student misses the judge. MSEF Region 7 Fair General Awards Judges consist of faculty, staff, and graduate students at the University of Mississippi. General Awards Judges will judge projects for 1st, 2nd, 3rd, 4th, and 5th place awards. A minimum of two (2) judges must score and sign off of each student’s project at the fair. Once two judges have signed off on a student’s project card, the student may leave the project area and sit with their teacher or parent. All students will be required to remain with their projects for the morning General Awards judging. If a judge misses a student due to the student and/or project not being present at the time of judging, the student will receive a null score for that particular judge. Judges will NOT come back through as they will leave the fair once finished judging. At this time, students and schools will be able to break for lunch. There are a number of on-campus vendors, including the Rebel Market, The Grill at 1810 in the Manning Center, and the Ole Miss Student Union. There are a number of fast food restaurants off-campus and delivery vendors, including Papa Johns Pizza, Jimmy Johns, and Bim Bam Burgers to name a few. Once morning judging is finished, local schools and the community are encouraged to browse the projects. This also gives fair participants a chance to view projects of their peers. News and media outlets will also attend at this time. Best of Class/Special Awards Judges will review projects during the break to determine if special judging is needed. As students return to their projects, they will find a GREEN sheet on their table indicating they have been chosen for additional judging for Best of Fair. If a student does not receive a green sheet, this does NOT mean the student will not place or receive a special award. Students that did not receive a “green” sheet for Best of Class judging will be able to start dismantling their projects and tables once the fair committee announces Best of Class judging has commenced. Once Best of Class Judging has finished, the Awards Ceremony will begin immediately. The Fair Committee will award those students that placed 1st through 5th during the General Awards Judging. Special awards will given thereafter. Finally, the Best of Class awards will be given to the students scored the highest in special judging. NO students and/or schools will be allowed to dismantle or remove projects from the arena floor until after the Awards Ceremony has concluded for the fair. It is disrespectful to other students and schools and detracts from the awards ceremony. At the conclusion of the Awards Ceremony, students and schools may begin packing their buses and personal vehicles. Any projects remaining in the Coliseum will be discarded. Lost and Found – MSEF Region 7 Fairs is NOT responsible for lost or stolen items. Please make sure that you have all belongings before leaving the Coliseum. All participating schools in MSEF Fairs are required to submit a school registration with the Key Teacher’s information annually. These forms serve to update contact information and to give our office an estimate of the number of students to potentially plan for the upcoming fair. The registration should be for each individual school, not the school district, even if the SRC/IRB committees are shared among multiple schools. It is expected that local fairs have a standing Scientific Review Committee (SRC) and an Institutional Review Board (IRB). Our office understands that personnel and resources are scarce for some schools, so please do not let this piece deter your school from participating. All projects will be reviewed by the MSEF Region 7 SRC and IRB committees before the regional fair. All projects for the upper regional fair must be registered with our office no later than the project registration deadline listed above. The cost of registration is $20 per project submitted. The Key Teacher is responsible for collecting the forms. The school must send one check for all of the project registrations to our office, payable to “University of Mississippi” with memo for “MSEF 7 Lower Fair”. Lower Fair participants are NOT required to submit completed ISEF forms with their project registrations. These forms are required for all Upper Fair projects participating ISEF-affiliated regional, state, and international fairs. Key Teachers – It is up to you if you want to introduce your 6th grade students to these forms to get them familiar with these forms for future research projects. For directions, parking instructions, and map, please view the following printable PDF.